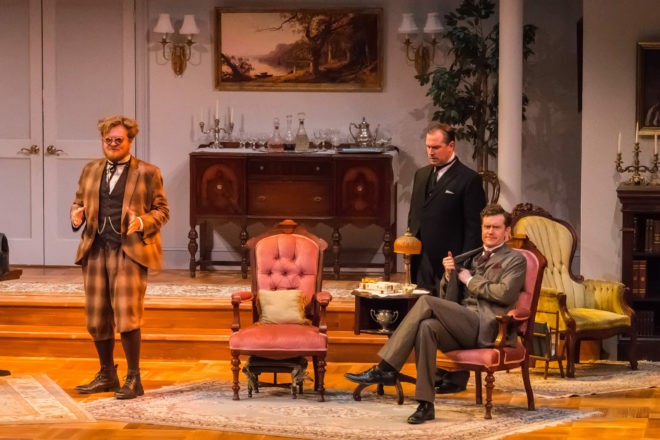 (Left to right) Harter Clingman, Karl Hamilton and Matt Holzfeind in Peninsula Players production of “Lord Arthur Savile’s Crime,” on stage now through Sept. 3. Designers Christopher Krizand, Jack Magaw, and clingman are among artists nominated for Jeff Awards. Photo by Len Villano. Company members of Peninsula Players Theatre celebrated the announcement of Chicago’s 2017 Joseph Jefferson Award nominations with the listing of several current and past company members. The Joseph Jefferson Awards are Chicago theaters’ equivalent to Broadway’s Antoinette Perry “Tony” Awards. The Joseph Jefferson awards, established in 1968, annually honor outstanding professional theater artists in the Chicago theater community. Matt Crowle, director of Peter and the Starcatcher is nominated for both Best Direction and Best Choreography for Crazy for You at Drury Lane. Crazy for You is also nominated as best Production-Musical-Large and its cast featured Peninsula Player veterans William Carlos Angulo, Harter Clingman, Ashley Lanyon, Shawn Stengle and Lucy Zukaitis. Also nominated for Best Choreography are Ericka Mac for her work on Mamma Mia! at Marriott Theatre and Tammy Mader for her choreography of Singin’ in the Rain at Marriott Theatre. Mercury Theater Chicago’s production of Disney’s Mary Poppins is nominated in the Musical-Midsize category and featured several Peninsula Players in its cast including Crowle, Cory Goodrich, Lanyon and Kevin McKillip. Additional Players alumni actors, designers and directors nominated include: Cassandra Bissell for Best Principal Actress; E. Faye Butler for Best Supporting Actress-Musical; Jim Corti for his direction of Sweeney Todd: the Demon Barber of Fleet Street; Christopher Kriz for Original Music; Jack Magaw for his design of East Texas Hot Links; Kymberly Mellen for Best Supporting Actress; and Doug Peck for musical direction of Wonderful Town. For more information or for current show times visit peninsulaplayers.com.